The TYMCO Model 600® pick-up head incorporates full-width air blast and suction and is designed to work effortlessly with the TYMCO Regenerative Air System to pick up a wide variety of street debris from light trash and leaves to heavy dirt and gravel. The Model 600 pick-up head also comes standard with long-lasting Duo-Skids® which provide increased sweeping performance and longer wear. The Model 600 may be equipped with the optional Broom Assist Head (BAH) for applications where a broom may be desired. The BAH is controlled by the operator in the cab by a single switch allowing broom-assisted sweeping only when needed because the majority of debris is removed by the powerful TYMCO Regenerative Air System. The large 12” diameter by 79” long broom is mounted at the rear of the BAH and is fully enclosed for optimum dust control and eliminating risk of “throwing” debris outside the sweep path. The fast rotating BAH broom provides excellent performance by automatically applying as much pressure as needed to loosen heavy, packed-on debris and projecting it into the air blast for faster sweeping. The Model 600 hopper capacity is over 7.3 cubic yards and ensures owners a payload of over 10,000 lbs. The TYMCO raker-assist dumping system provides smooth discharge of debris from a stationary hopper without requiring unnecessary telescopic hydraulic cylinders for hoisting, hydraulically controlled door latch assemblies, additional hydraulic door opening cylinders, grease points and safety concerns such as pinch points and overhead clearance. The 600 hopper comes standard with two easily accessible inspection doors located on both sides of the hopper. The 43” diameter Model 600 gutter brooms remove debris from curbs, gutters and around obstacles along city streets such as parked cars and maintenance equipment. An optional tilt adjuster allows you to reach down into the deepest curbs or gutters typically found throughout city industrial and residential streets. The innovative gutter broom provides excellent performance by automatically determining the “digging” pressure needed for different debris; therefore, owners get maximum gutter broom bristle life and sweeping performance. If the gutter broom encounters an immovable object, it will automatically retract to avoid potential damage and return to the original position once the immovable object has been passed, all without intervention from the operator. The Model 600 is the only street sweeper on the market with a high-efficiency centrifugal dust separator for maximum fine dust particulate separation which provides excellent dust control while using less water. TYMCO’s engineers take several aspects into account when designing for better dust control such as water nozzle design and placement, not just adding more water like other street sweepers. The Model 600 has a water capacity of up to 440 gallons which provides hours of sweeping while maintaining excellent dust control. The Model 600 is powered by a 99 horsepower John Deere auxiliary engine. This engine powers all hydraulic functions through a gear driven pump and directly belt drives the blower. The lightweight aluminum alloy blower that drives the TYMCO Regenerative Air System only requires a modest amount of horsepower; therefore TYMCO’s engineers designed the Model 600 around a smaller, more fuel efficient auxiliary engine. 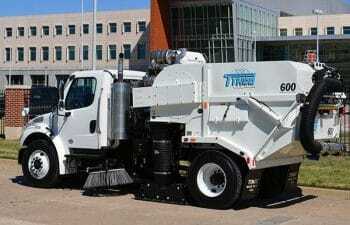 The Model 600 is the only street sweeper that utilizes a super-efficient aluminum alloy blower that is self-cleaning and reduces fuel consumption because of its lightweight design requiring less horsepower. The blower is designed to work with the TYMCO Regenerative Air System to both push and pull air which delivers even greater sweeping performance. The Model 600 blower has a natural rubber coating that provides maximum wear against abrasive debris. The cabover truck chassis allows the Model 600 to carry additional water for dust control as well as provide space for toolbox storage and maintenance tools such as shovels, rakes and brooms. The additional storage provides more versatility if other maintenance tasks need to be taken care of after sweeping such as tending to municipal parks or other city landscaping.